Colour blindness is a condition in which a person loses his ability to differentiate between a few colors. 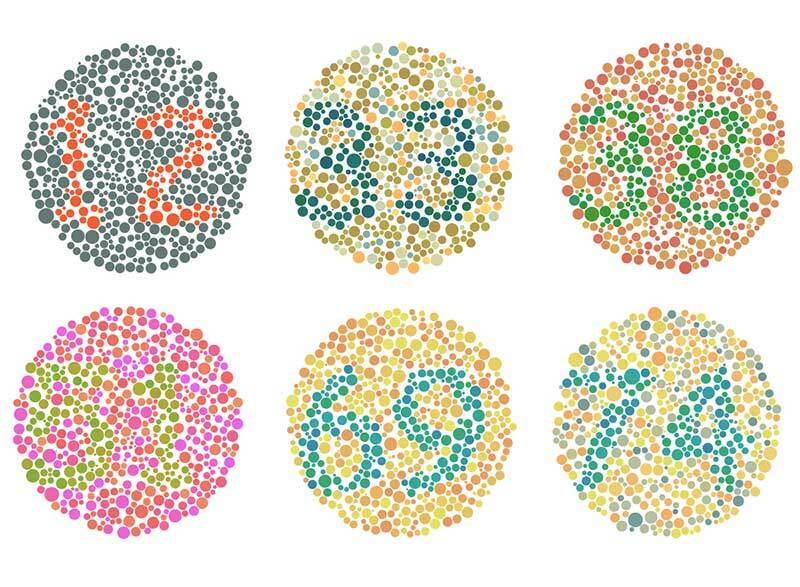 This means that color blindness person will have trouble identifying blue or green and red and also the mixture of these colors. It is a very rare phenomenon that a person will lose his ability to see the color at all, this is called as monochromacy. It is a use this belief that a color blindness will see things only in black and white. But this is not true. Colour blindness can be of different levels. In India, color blindness is mostly affected male and it affects only 0.5% of the females. How do we see color: Human eye sees color after a simulation in the retina. The retina is made up of rod and cone cells. Rod cells are located in the circumference of the retina this helps us in seeing an object. Rod cells cannot differentiate between the colors. Cone cells are the cells located in the central of the retina. These cells help us to see at night and also they can differentiate between colors. Color blindness is of three types, each of which has sub-types. This is the most common type of color blindness due to family inheritance, due to damage to the red cone or green cone pigment. Protanomaly – This color blindness is due to abnormality of red cone pigmentation. In this type of color blindness, the person sees the world as red, orange, yellow and green but the colors are not bright. This condition is mild and usually does not affect the daily life. Protanopia – In protanopia, the red cone pigment stops working and red appears black. Orange, yellow and green appear in all yellow colors. Deuteranomaly – This color is the most common type of blindness. In this green cone, pigment acts abnormally. Yellow and green appear red in it and it is difficult to identify purple and blue colors. This condition is mild and usually does not affect the daily life. Deuteranopia – In this color blindness, green cone pigments stop functioning. For a person suffering Deuteranopia red colors appears as brownish and green appears as yellowish. Blue-yellow color blindness is rarer than red-green color blindness. In this kind of color blindness, either the blue cone pigment (Triton) is completely absent or stops functioning. There are two types of blue-yellow color blindness. Tritanomaly – In this, blue cone pigments cease to work properly. A person suffering from Tritanomaly sees green as blue and it can be difficult to differentiate from pink to yellow and red. Tritanopia – People with Trinopopia have a lack of blue cone cells. It looks green in blue and yellow looks color purple or light brown. People with full-color blindness are unable to see color at all, and their vision can also be affected. Cone monochromacy – Two or three of three cone cell pigments do not work in it. Red cone monochromatic, green cone Monochromacyand blue cone Monochromacy. People with cone monochromacy have difficulty in distinguishing colors because the brain needs signals from different types of corn to see the colors. When only one type of cone works, this comparison is not possible. Rod monochromacy – It is present from birth. There is no functional pigment in any of the cone cells. People with rod Monochromacy appear in the world black, white and gray. People with rod Monochromacy are photophobic in very bright environments and very inconvenient. Inability to recognize certain colors For example, not to tell the difference between red and green colors, but to can easily differentiate in blue and yellow. Can see only black, white, and gray colors (in weak cases). Only one type of color can be seen. If your eyes are normal, then you can differentiate between different colors, but if your eyes lack cone cells or light-sensitive chemicals, then you can see only two primary colors. Color Blindness due to family reason is more common in the male population. The most common color blindness is red-green, while blue-yellow color blindness is very low. The possibilities of not seeing any colors are too hot. Due to family disorders, you may have a moderate, severe or severe level of disorder. Color blindness due to family disorder usually affects both eyes and its intensity does not change in your lifetime. Some situations that can cause color blindness are sickle cell anemia, diabetes, macular degeneration of the eyes, Alzheimer’s disease, glaucoma, Parkinson’s disease, ancient alcohol addiction, and leukemia. In this one eye can be more affected than the other and color blindness can be treated if the disease associated with it is treated. Some medicines that treat heart problems, hypertension, erectile dysfunction, infection, neurological disorders, and psychological problems can also result in color blindness. As you age, your ability to see colors gradually decreases. Exposure to certain chemicals in the workplace such as carbon disulfide and fertilizer can result in color blindness. Previous story How to know its time for the Cataract Surgery !